Even though there were no panels on day one of Star Wars Celebration, that doesn't mean Lucasfilm is not making news. Lucasfilm president Kathleen Kennedy made some exciting Disney+ related announcements at a Disney shareholders event. 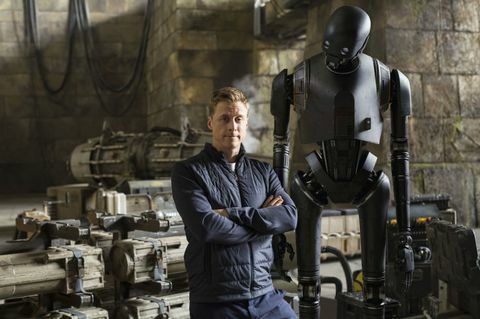 First, she revealed that Alan Tudyk will be reprising his role from Rogue One: A Star Wars Story as K-2SO in the upcoming Cassian Andor prequel series, launching in 2021. Tudyk joins his Rogue One castmate, Diego Luna (Cassian Andor), in reprising their roles for the series. In addition, Kennedy confirmed that Stephen Schiff will serve as showrunner for the series. Schiff is best known for his work as an executive producer on the hit FX series The Americans. Schiff's involvement was first reported back in November. Disney+ will launch on November 12th in the US. The untitled Cassian Andor prequel series will be the third Star Wars series to hit Disney+, after The Mandalorian (which will learn more about on Sunday at Celebration) and the return of the beloved animated series Star Wars: The Clone Wars.